348 E. 9 Mile Rd. At Hazel Park Urgent Care, walk-in patients are welcome. If you would like to set an appointment, please fill our form. Our clinic tends to patients who suffering from non-life threatening injuries or wounds from auto accidents. Be sure to check for current promotions! 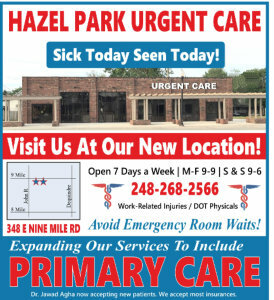 We thank you for choosing Hazel Park Urgent Care. Expect great service the moment you walk into our urgent care center – no need for appointments, just immediate and diligent treatment. We cater to patients with non-emergency medical needs such as treating injuries and non-life threatening illnesses. All Ages: Our staff is happy to treat patients of all ages including children as young as 6 months. Financial Option Available: Hazel Park Urgent Care partners with Care Credit to offer you no interest financing. Hazel Park Urgent Care is proud to serve Hazel Park, Royal Oak, Ferndale, Madison Heights, Highland Park, Detroit, Oak Park, Clawson & Warren.